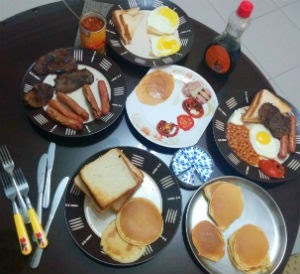 Today, we had a home-made English breakfast complete with bulls-eye, toast with cheese, beans, sausages, pancakes, grilled vegetables and breakfast steak. Today is my birthday, so it was a small family celebration. We had some goof ups but it was all okay. For instance, I was in charge of pancakes, so after they were done, they were thick and out of shape. I was going to say “Why on earth have you made the pancakes so tough?” when I remembered it was me who had made them. But thankfully, they didn’t lose their taste. And Mom accidentally spread cheese on her pancakes instead of butter. The entire thing was planned by Dad and me. Yesterday we bought all the necessary things. We gave Mom a day-off and worked hard in the kitchen. At last everything was done and we had a hearty meal. In the aquarium at Dubai mall, they are bringing in two crocodiles. Jock the croc and his girlfriend Missy are going to arrive at Dubai in a specially equipped Singapore Airlines jumbo jet. So I hope I get the chance to go to Dubai again. I mean, that would be wicked!